The thing is….I don’t care if anyone wants to come on and offer up their take on a singer or band featured previously in what is proving to be an incredibly popular series. The e-mails have been coming in thick and fast from all corners of the globe and there is a small backlog of posts building up but as far as I’m concerned that’s perfectly acceptable. I’ve always said this blog is only as good as the contributions from readers whether that be via comments or guest postings and the quality and depth of stuff in this series really has invigorated the whole process. Today’s contribution has come in from Sweden courtesy of Martin Elliot…. In a few weeks I’m off to see Peter Hook & The Light playing New Order and Joy Division, and the other week I got my ticket to the New Order show in Stockholm on November 8 – I just had to give this a go. Following JC’s limitations to tracks that I have (or have had) on vinyl limits the album a bit, bit I guess also made it possible as many tracks just didn’t fulfill the criteria. Considering the length of the tracks in reality this would be a 2 LP set, but I made it into a very long LP. The track that defined New Order as a band on their own merits, not the continuation of Joy Division. Don’t get me wrong, I love JD – maybe even more today than 1980, but Blue Monday made NO into the fantastic band they still are. There is no way I could start a NO compilation but here, the line that marked the before and after. The lyrics always concerns me, what happened that day 1963? Brilliant. 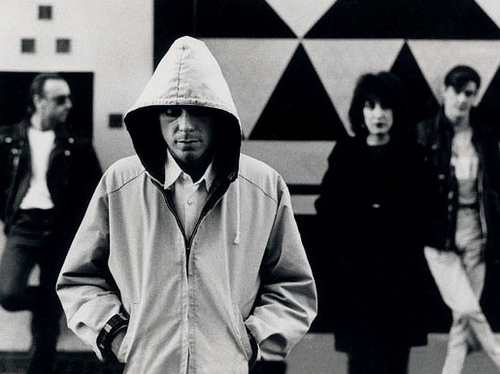 New Order goes to Detroit, the worn down industrial cities works just perfect together. Can’t stop dancing. As many I regard Technique as the best NO album, but in my book Republic is pretty close as a consistent album. This version of Regret by Sabres is pure beauty. I think JC said it, it just had to make a fantastic end to the a-side – not start it. Could be my all time favorite NO remix, runs just over 10 minutes and I always wish it would go on. Dance ecstasy. Another 10+ minutes mix, another magic dance track. They did put out a lot of brilliant 12″ singles, didn’t they? Like this. A beautiful closing track, a beautiful farewell to Ian. As many of the readers of this blog I remember when the early buyers of an album were treated with a bonus 12″ or EP, so I give you a limited edition bonus record – a single sided 12″ with the full 17 minutes version of Elegia. Because I still love Joy Division. I’m with you all the way on this, Martin. Top one. I’ve always regarded the 12″ of “Perfect Kiss” as aural ecstasy. I saw NO a few times around the original release of that and the wall-of-sound live version stills blows me away when I think of it. Thanks for this comp. Wow so much unapologetic love for Republic! Nice to see someone stick to their guns on this. I wish Technique didn’t sound as dated to me as it has over the past 15 yrs or so, but you hit the nail on the head with that Saunderson remix of Round + Round! Not to detract from any of your great choices, but I have always been fond of the Perfecto remix of World which is direct and cool. Republic is my favourite album of theirs too.